How do I know that all of the efforts my hotel is putting into social media are paying off? Once we’re on the right track and start hitting immediate goals, where’s next? Just as developing a social media strategy is the critical first step, measuring and analysis are the important way to conclude a round of activity. Hotel social media metrics are the key to answering important questions with certainty instead of a shrug. What analysis applies to obvious numbers like follower counts? How can we tell that our efforts to engage more deeply have been successful? What tools are there for hotels to measure the success of their customer care activities on social media? What’s the best analytical approach to monitoring our hotel’s brand on social media? The key point to keep in mind as we dig more deeply into your hotel social media metrics is that social media marketing goals must remain attached to your boutique hotel’s business goals. Metrics are rooted in data, but their utility comes from determining what the numbers mean. These ideas also flow into how social media analytics can be used to steer marketing decisions. Follower Counts: Important Measure or Just for Vanity? It just seems logical that social media is a numbers game. That outputting paying customers from the ecosystem should be mainly about how many people see your message and that that flows directly (and above all else) from how many users follow your accounts. This might have been true in the early days of Twitter and Facebook when access was free and users applied much less cynicism to what they saw on social media. But now it’s depth, not width, that matters when trying to reach an engaged audience. At some point in your hotel’s social media marketing plan growing your follower count might be critically important. Give a boost of confidence to potential customers who might not take your boutique hotel seriously at 24 followers, but would at 240. Deal with channel-specific concerns like the idea that the Instagram algorithm looks at your relationships to decide where your posts should appear. As your accounts mature and you grow beyond the baseline, what role can your follower counts play in how you monitor your social media metrics? By acting as a denominator for engagement metrics, i.e., what fraction of your Instagram followers like your posts? As a velocity metric for measuring and tracking how different activities correlate with audience growth. Large jumps can help to evaluate special activities like contests and other social media campaigns. The number of people who follow the link in your bio and end up completing a booking with your hotel. Which version of your discount code (based on having different ones for different social channels) was the most successful? Do cost-intensive activities like video production line up with profit-intensive results like direct bookings? 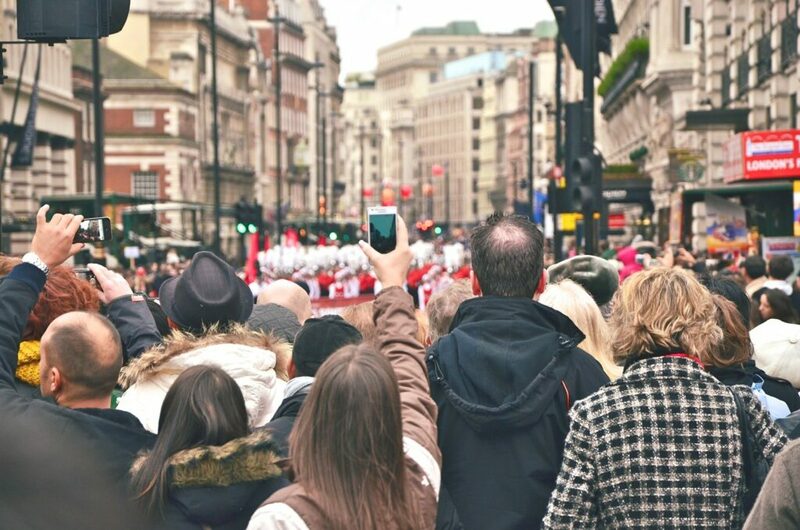 At what point in the buying process (awareness, consideration, decision, loyalty, advocacy) do customers become social media followers? 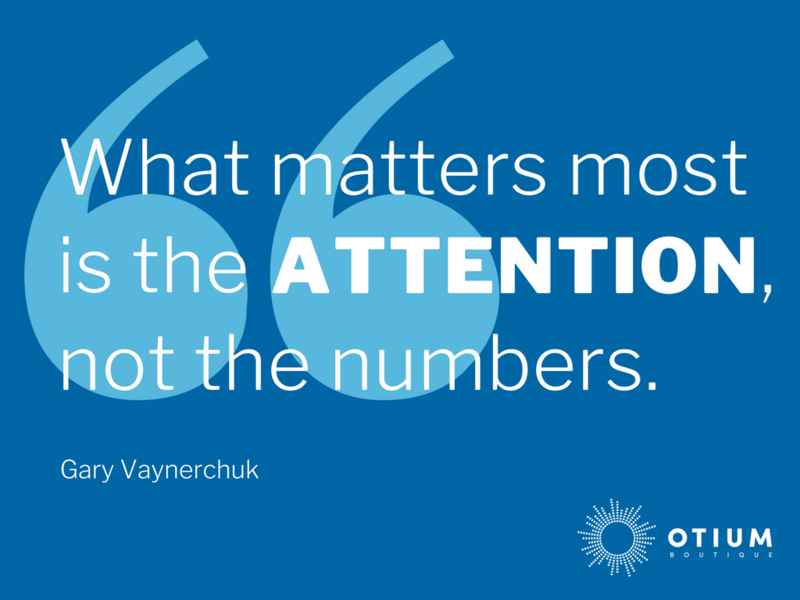 Gary Vaynerchuk on what matters: earning attention on social media, not chasing numbers. Conversation rate: This is the percentage of your followers who (on Facebook, Twitter, or Instagram) feel inspired enough by your posts that they comment on them or reply to them. The algorithms for all three networks grant a large number of “points” to posts with a high conversation rate. Applause rate: Similar to the above, this is the percentage of your followers who liked your posts over a given period of time. Even with thousands of followers, some posts won’t get any comments and many will have such a small number that it’s difficult to draw solid conclusions, but likes vary more widely and, over time, correlate more closely to impact. Amplification rate: Especially for posts from brands, followers are more hesitant to share posts (compared to liking or commenting) so it’s useful to see what percentage of them were willing to do this. Success with this metric is often the difference between solid and exceptional social media results. By tying the social media-related pieces of your hotel’s marketing plan to measurable business goals, social media metrics help justify what you’ve done already and decide what you’re going to do in the future. Lots of different social media functions can be automated. Posts are scheduled in a calendar and tools are available to make sure they go up on time. But, for now at least, customer care usually requires a live human on the other end of the conversation. Of the 7,000 consumers, from seven countries, 89% put the speed of response and speed of resolution as their top must-haves for service. 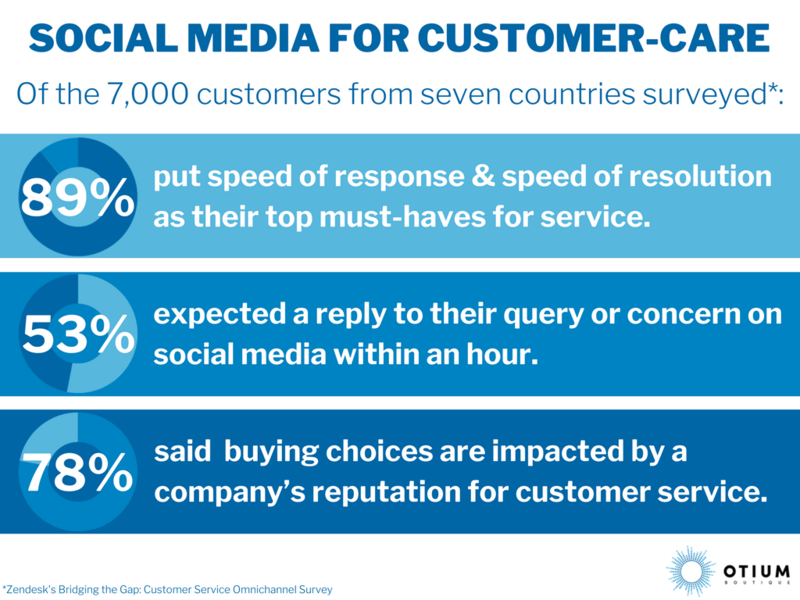 53% of respondents expected a reply to their query or concern on social media within an hour. And a remarkable 78% said their buying choices are impacted by a company’s reputation for providing customer service. A snapshot view of what matters to people when it comes to custom-care on social media. Most companies who are considering how to use social media as a customer care tool (and definitely all boutique hotels) have some existing customer care experience through a different medium like by phone or e-mail. But because it is open-ended and customers can become distracted between interactions, it is difficult or impossible to measure social media support with traditional customer care metrics like the time between first contact and resolution or contacts per hour. Social media users have very high expectations for response time. Even if they are just asking a question on Twitter, more than half expect a response within an hour. Not every customer message is created equally and it’s more critical to deal with the urgent ones urgently. Customer expectations vary by social channel. From Twitter, with the highest expectation for a quick response, to Instagram, where users understand that, for instance, a question posted via a comment on a photo might take longer to answer. Many customer interactions that start on social will end up being resolved by phone, chat, or email. When working against the double pressure of lofty customer expectations and aggressive competition, the metric worth analyzing here is probably your improvement over time. If your social media customer care is seeing month-to-month improvement it is likely making a positive impact on revenue. The Gaylord Opryland Resort & Convention Center took customer care to the next level when a guest reached out to them on social media. Social media channels are no longer a soapbox to stand on and a megaphone to shout through (or maybe they really never were), but the advice that it is better to shut up and listen applies more than ever. As we strive to use our own social media posts to start conversations about our brand, it’s also important to monitor and analyze the conversations that others are having. Set up alerts to spot current customers who could urgently use some help with their booking. Keep in mind that a frustrated customer might not take the time to find the correct spelling for your hotel’s Twitter handle. Similar alerts can find recent customers with positive things to say or beautiful photos to share from their stay and amplify this message to your own network. Powerful search tools on Twitter allow you to find users who are in the process of booking a vacation and might be gently steered to considering your hotel. Judge what the general sentiment is for your boutique hotel. How do customers see your brand? What do they tell their friends about? To them are you a cultural hub, dining destination, or a jumping off point for an escape into nature? Notice how competitors use social media and analyze whether there are gaps or opportunities for you to exploit. The Batu Karang Lembongan Resort listens to mentions on Instagram, regramming a guest’s image showcasing the sunset from the resort’s cafe and bar. As an analogy, social media marketing activities can feel like flipping switches in a bank of dozens when we don’t necessarily know which switch turns on which light. 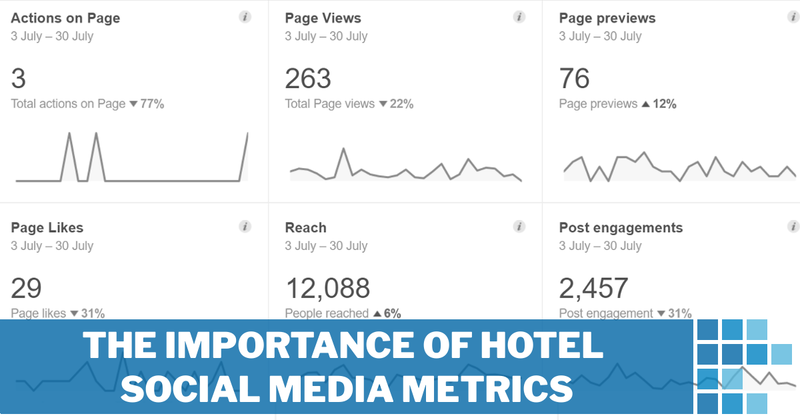 By measuring your hotel’s social media metrics and then applying the social media analytics techniques discussed in our previous post we’ll be able to judge which bulb is casting the most light and therefore generating the most revenue for our hotel. Keep your follower count in context. Seek deeper engagement with followers and measure progress along this path. Analytically measure your customer care activities. Listen for signals worth analyzing. This type of measurement and analysis is an essential part of the social media strategies we develop as part of a greater boutique hotel marketing strategy. Get in touch and we’ll be happy to get started on tailoring one for your business. 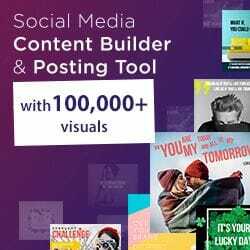 David specializes in creating content that connects with readers and designing social media strategies that get results. When he's not digging into digital marketing theory, he can usually be found touring Toronto's craft breweries or trying to keep up with his Brittany Spaniel.